With summer just around the corner, we are excited for the sun, warm temperatures, and longer days. But, we all know what summer also means: flies and pests. And lots of them. I agree with those other reviewers who comment on the fragility of this sheet. However, if you don't have a horse that is turned out with others, or is a blanket destroyer, this is a good sheet. It's lightweight and offers neck protection. I have 3 horses, and replace these sheets every couple of years. They are turned out separately. I do repair the tears, but the lightweight fabric keeps the horses cooler than the more durable ones. My horse wore this for 3 days and it ripped all down one side. Most of the Amigo products are well made. Not this one. I will never buy this type of fly sheet again. Ordered this last year for my 27 yr old gelding. He's super sensitive to flies and whelp up, and he's more sensitive to heat now. This sheet stayed in place better than any other blanket or sheet I've had. Mesh was super soft and kept him cool. It only lasted me one season.... but it's a fly scrim, they are delicate. I patched a few holes with my sewing machine over the summer but no biggie. I'm ordering another one for this year. It was a gem. I love how the amigo fly sheet feels and leaves my horses slick. However, poor quality. The Velcro is sticking to the sheet and making it fray. The tail flap has torn at its stress points as well as the belly straps. I bought two. It's been a week. Also, the buckles are already rusting. Maybe if my horses lived in a stall it would hold up but for turn out, don't waste your money. 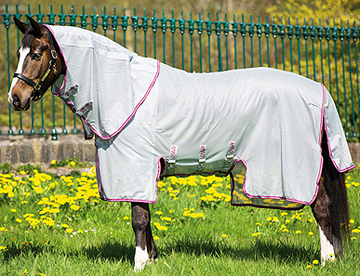 This fly sheet works, however if your horse is allergic to insect bites like ?Ç£No See Ums, sweet itch?Ç¥ then your horse will rip this fly sheet to shreds. I have been using the same fly sheet since 2011 for one of my horses at night because he was getting eaten up by mosquitoes. My new horse is allergic to the ?Ç£No See Ums, sweet itch?Ç¥. I put this blanket on her and she ripped the sheet time and time again and she was getting the ?Ç£No See Ums, sweet itch?Ç¥-sores. I then started to fly spray her whole body and face and she has not ripped her fly sheet since. It seems a little over kill but she does not have sores and is not scratching. So if your horse is ripping your fly sheet - the fly sheet alone is not protecting your horse and you will need to apply fly spray. This product is worth the price and as many times I have repaired this fly sheet it is repairable. My gelding has summersore, a horrible condition for a California horse. THis sheet covers him the best, lasted almost 3 seasons! it washed well. Keep away from other horses because they'll tear it. Great value. I purchased this fly sheet for my gelding and it seemed to fit him fairly well. However, he ripped it to shreds within about 2 weeks. "Amigo Mia ripped the first few days"
I was hoping this would be a great buy, but my mare ripped it the first few days she wore it. A really good sheet, I have only used a couple times this year but works great. the sizes are right(don't run small or big). Awesome price for the quality of the sheet. Jeffers the only that it could use is cross surcingle on the back legs and some sort of clip thing so that the neck cover would stay in place when horse is standing up tall. (so it could clip to a halter or fly mask). Still the best sheet I have ever purchased. its a must buy! "It is well made.I am impressed!" I got this flysheet last Monday.When I got it I put it on my horse and the sheet itself had good material.It is breathable,and its easy to take off, very secure and the material is so soft it will not rub the horse.Although,the neck piece is a bit long,but other than that It was worth the money. Nice looking fly sheet, holds up VERY well (even for horses that are hard on sheets), feels very nice not rough at all and will not rub your horse raw. I plan on buying two more for my other horses, the price is alittle high but it's a great sheet and well worth the money. "If I could give a 10 I would"
My trainer has one of these for her stud that is a good 10 years old. It is indestructible. And yes, I said STUD. You can't go wrong!! !